After being spoiled by working in a fully equipped sewing studio for many years, I finally decided to set up a small sewing nook at home. Although I don’t have much space, and the sewing area is going to be relegated to a small corner of a dark and cold basement, it’ll be nice to have a bare bones sewing area for those times I don’t feel like commuting to sew on the weekends. For this space, I needed all new tools and equipment, but I wanted to keep the budget low. With that in mind, I thought I’d share a few different options for setting up a new sewing space, or upgrading the one you have. If you don’t have much room or don’t want to spend too much money, this is a good place to start. You can really build onto this foundation, but this is enough for you to get going on your first project, adding tools as you find a need for them. That’s my approach. Links to the tools are below. Some are in our shop right now, others are amazon affiliate links, but you can also find many of these tools in your local sewing store. Total cost: About $229, including the $100 I paid for my machine (excluding maintenance). This doesn’t include supplies for individual projects (like thread), and it does assume you have a few basics at home, like a functioning iron and and ironing board and a table. This is a very, very basic set up that can get you through at least a few projects before you start itching for more. These are some common tools and equipment you might add over time, as you uncover new needs or interests. These are the ones I plan to add as space and needs arise. 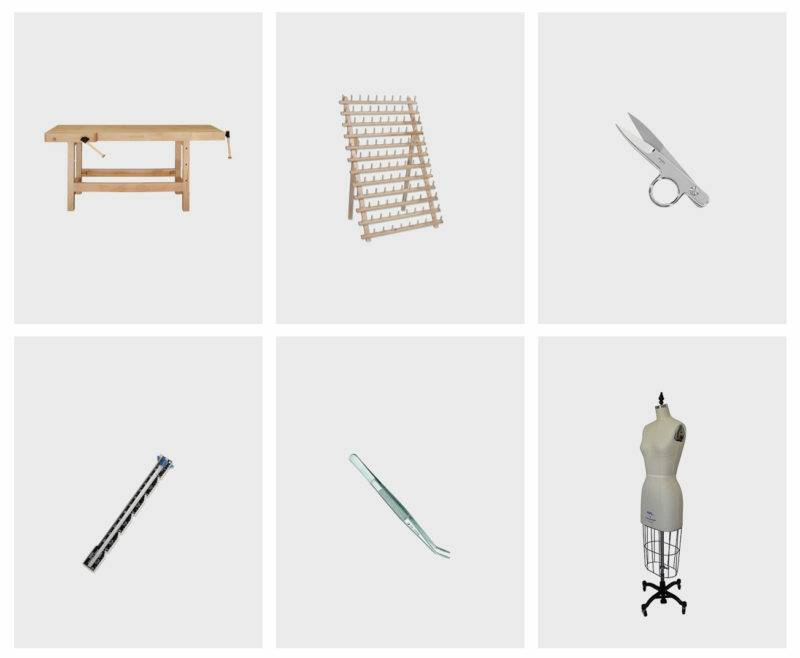 Of course, you wouldn’t need all of this at once, and some things you could find cheaper solutions for, or ignore all together (like a sewing cart). Over time, you find more and more handy tools. 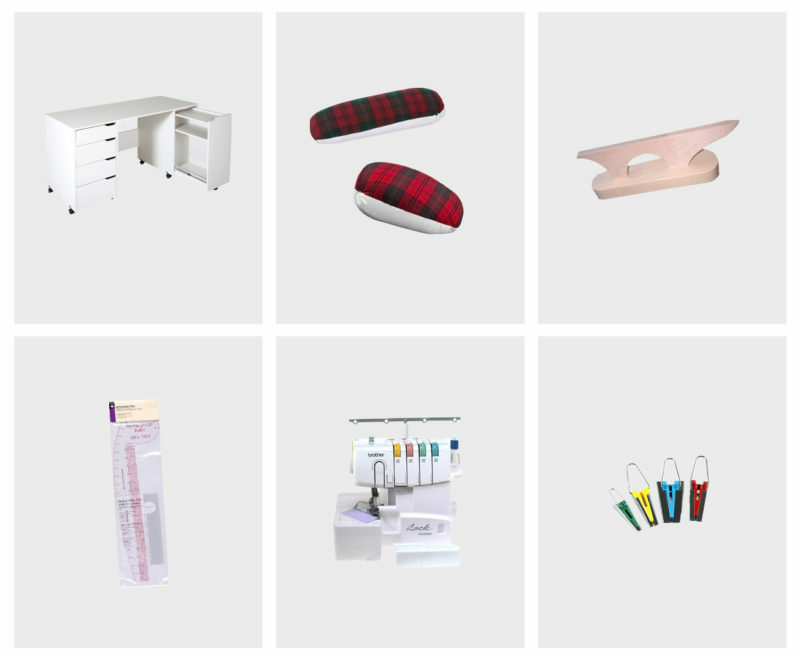 The options here are endless, but here are some of the ones we get the most use out of in the ColetteHQ sewing room that you might not have yet. Some require a fair bit of space, others are more specialty tools that still come in handy. Total cost: $852.13, including $499 for a dress form. Again, cheaper options are available! 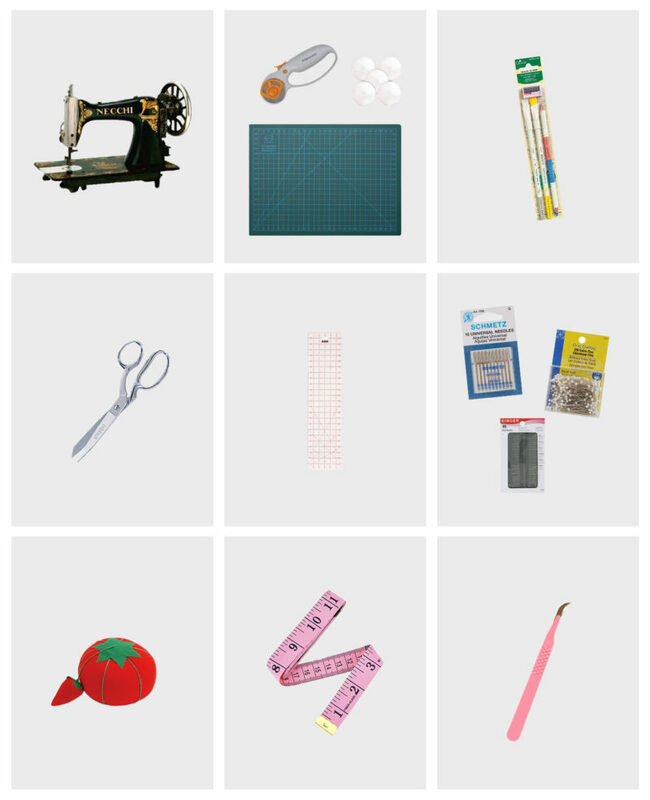 Of course, there are many, many, many other tools you can add to your sewing kit as you need them, but these are the ones I’d say I use most frequently. The three options build on one another, so you can upgrade slowly over time. Sewing Chatter: What’s your favorite sewing tool? Sewing Chatter: How do you throw your own sewing party? Hey Linda! Check out David Page Coffin’s article, A Pressing Matter, for Seamwork Magazine. You’ll learn everything you’ve ever wanted to know about pressing! Fascinating! I’ve never had much more than the minimalist space setup, although I did finally get a serger (at Wallace’s urging!) and wow, do I love it. Right now I have a sewing machine, serger, and two desktops crammed onto 2 tables along 1 wall in my home office (which is itself tiny — I call this setup my Machine Death Row). There’s actually so little space that the sewing machine and serger sit behind one another, and I have to move one keyboard if I want to pull out my serger, haha. Pressing happens on the kitchen table, which is good for forcing me to get up and move. I usually group my sewing so that I get as far as I can in multiple parts of a garment and then go press everything simultaneously. As to tools I’d add, I love the pen style chaco liner. So easy to use! I like to store all my tools in an utensil basket I thrifted, the little compartments are perfect for holding scissors, rotary cutters, marking implements, etc., it’s compact, and the handle is great for moving it around. If your ever in Orange County, I’d recommend M&L Fabrics in Anaheim. They have a lot of fabric in the $2.99/yard range and quite a variety. I’m from Westminster and used to shop at M&L in high school all the time! It’s massive, and great for discount fabrics. Very cheap. If you can get up to Los Angeles there are tons of options… the fabric district plus wonderful stores like Mood and The Fabric Store. I’m not as personally familiar with San Diego. Try Dharma Trading! I think they’re in SoCal as well. Great prices on silks! Dharma Trading is in Berkeley but you can shop online. Actually, Dharma Trading is in Healdsburg/Petaluma, unless they now have a retail store in Berkeley. I order from them all the time. Their prices on fabric undercut most outlets, but mostly they deal with white for dyeing. they do have silk in colors though. Very fun catalog to browse. You are so right and I am so OLD. They closed their Berkeley store in the late 70s, and that’s the one I’m thinking of — you can find a photo of it on the web. I started knitting in the 70s and I went in their to get wool and they were so incredibly nice. After a long creative hiatus I started ordering from them when I began to sew and knit again, without even thinking they were no longer in Berkeley! I agree that fabric shopping in San Diego is hard! I am about 45 minutes away from the National City Yardage Town so have to make do with the Yardage Towns further north. I wish there were more stores for clothing sewing! Me too Sharon. I’m in central San Diego (I live near Balboa Park) in Goldenhill/South Park. I find some gems in Yardage Town, but it requires combing over each stand of Bolts touching everything and looking at fiber content. The National City one is huge which is why I deem it the best. I am sorely disappointed and I have lived here for 37 years. There isn’t a huge sewing “community” at least that I am aware of and the small business/artisans are slowly on the rise as it seems we are late to the party. **Shannon, sorry, I dunno why I read Sharon. Pattern weights! It’s easier to buy a bunch of cheap flat washers than rely on soup cans or other heavy knick knacks. Also, tracing paper! I recommend a large, flat basket to store the current work in progress. I don’t have a dedicated sewing space. Instead, I use my kitchen table during the day when my children are at school, or in the evenings. This means I need to keep my set-up very streamlined and make sure that I can pack up very quickly. My kitchen table is extendable and makes a good cutting table. My sewing machine is stored in an accessible place, my ironing board and iron likewise. My basket, as described at the beginning of this comment, holds all the requirements for the current project – pattern, fabric, notions and a tray with scissors, pins, tape measure, seam ripper, the appropriate presser feet etc. Cut-out garment pieces are loosely rolled and laid on top of the basket. Once a garment gets to the point where it can be put on a hanger, I keep it on the back of a door. The basket itself can be stored on top of my wardrobe. I can set up and pack up in five minutes or less. Awesome idea! Love the flat basket idea, I have two cats so I always have to put everything away. Great post! I so need to add a clapper to my supplies in 2017. I might suggest for vintage machine buyers to consider a vintage cabinet to go with it over a particleboard one. There are plenty of cute and inexpensive solid wood cabinets in thrift shops or on Craigslist that only need a clean and/or treatment with Howard’s Restore-a-finish to make them perfect for a MCM home. I feel like cabinets are completely overlooked with Ikea, Amazon, etc. dominating modern craft room looks but they can be fantastic for smaller spaces and are real furniture pieces. I have a cute small metal rolling cart from Ikea. I like to keep my current project in it along with sewing tools. They are only $30 . I took over our living room/dining room space years ago. It’s large and not well lit. I used solid core doors and kitchen cabinets to make work spaces but this article has sparked me to really plan and make a more useful space. Just planning now but I currently keep out and ready to use my sewing machine, serger (new), dress form and ironing board. I have bookcases of fabric (I quilt as well as sew clothing). Love the thread holder and custom cutting table you highlight. My lifetime of sewing is worth this effort. Thanks! I am curious how you are going to use/install lighting in your downstairs sewing place. I’m crammed into a low-ceiling’ed room and rely on reflected lighting for general purposes, and two luxo drafting table lights for task lighting. It’s not an ideal situation (resulting in installing a piece of moleskin wrong face out) for work, but with a 77″ ceiling, not many choices. ‘Can’ down lights were a mistake (too many shadows). I have the same problem. We have recessed lighting in the basement with low ceilings, so there are a lot of shadows. There are two small windows, so I’ve positioned things as close to those as possible. Next, I’m going to add some task lighting. I’m also hoping to find some floor lamps that can be reflected off the low ceiling to create more even light throughout. I have the same isses and wanted to ask the same question. It is about lighting in low ceiling spaces without daylight or only a little. It is for that reason that i do not want to move my sewing space down to the basement where i would have plenty of room! My last sewing corner had no light, so my husband put up closet-shelf-brackets and hung THREE workshop-style hanging 48″ fluorescent light fixtures, plugged into a power-strip. Not real pretty but very, very functional. Fluorescent shoplights don’t draw a lot of power . . . sewing machine and iron also plugged into power strip; tape deck got its own plug in the wall socket. Bigger problem was layout – I had a 2×4′ table for the sewing machine, a 2×4′ by 6′ tall set of workshop shelves, and the ironing board. Did most cutting on the floor, unless it was small things. Like I said, a corner, but the lights made it work. I’m really lucky to have a whole room dedicated to crafting and it’s mostly filled with ikea furniture. And a lot of my smaller storage units were found in thrift stores and spray painted to match the decor. Don’t forget to check there! What a great post for a beginner like me! As someone who lives in an NYC one bedroom with my partner, I can never really have a dedicated sewing space, but this is a good arc for my minimalst aspirations to follow. And I guess I’m ahead of the curve on vintage machines, because I sew on my mom’s 1960s Singer Featherweight, which I adore both for its simplicity and because I remember the lovely things she used to make on it. The only downside is that I have no zigzag or etc, so knits are out of the question for now. I’m toying with the idea of a basic serger to supplement my beloved vintage machine, rather than getting a newer and less charming sewing machine, and that seems to be in line with your post. Catherine, I would highly recommend that you keep your vintage straight stitch machine and add a modern serger to sew knits and seam finishes. Vintage machines like the one you have were made with metal parts prior to the 1970’s and they are real workhorses. As long as you take care of it, that machine will last for many years. Just add a serger as suggested in the article. Sergers are fun and quick. You can finish all the inside seams on your garments with one. You can sew any kind of garment with those two machines. Great list! The only change I would make is really to put the seam gauge way higher on the list. That seems like a fairly essential notion to me, and it’s one I use on nearly every project. How else do you make sure you’re pressing up the right amount on the bottom of a hem or things like that? Definitely one of the basics. Heather Ross’s book Weekend Sewing has another great idea instead of a sewing cart for small spaces–take an old armoire or office computer cabinet and store all of your sewing supplies and machine inside. Then you can tuck it away and close the doors to hide your stuff. Or some great vintage machines come with tables that you flip up to reveal the machine, then flip down again to store it after you’ve finished sewing. Great ideas in this post! In the last 4 places I’ve lived, to the point of forgoing a having my own bedroom in three of them. Siince I got married, I have had the TV room as my studio & in our new house I will have a purpose built space, for my how. Sewing business. .My cutting table is one of those hacks of two multi cube shelving units with a melamine desk top & full size cutting mat. you can find tutorials everywhere on Pinterest. My shelving consists of Mulig for my book & pattern library & shipping ‘centre’, it also has handy hooks on the ends to hang current projects. And a wall of Gorm basic wooden shelving for containers of fabric, yarn, scraps, buttons, trims etc. A pegboard mounted on the wall is useful for your tools ,ie. rulers, scissors, packaged elastic, ribbon, etc. You can see at a glance opposed to being in a drawer or box. Prior to moving into a condo (with limited space) I had a cutting table that we made out of a door mounted on a dresser. The drawers were handy for material and whatever you want to store. Have you ever used a rotary blade sharpener? I got one from modern domestic and it really saves from buying those expensive replacements. Also Swedish tracing paper has become invaluable. Also one of those round rubber bobbin organizers! I have to put all my things away and only have a dedicated spot for my machine but I keep all my tools in a labeled clear plastic shoebox from the container store. Have others for patterns, knitting stuff, etc and they stack in the upper shelves of a cabinet. For a dress form, check out ‘the shop company’ on-line. They sell professional dress forms that look like the Wolf forms for excellent prices.